National Congress Building, Brasilia – the symbol of an age… Photo by zelnunes. Built in the 1950s to showcase some of the world’s leading architects and their futuristic design vision, Brasilia, the federal capital of Brazil, was designed with imagination, innovation, and a futuristic urban aesthetic in mind, paved with good intentions. The brainchild of architect Oscar Niemeyer and urban planner Lucio Costa was proclaimed a UNESCO World Heritage site in 1987. But underneath soaring arches, dramatic towers, and whimsical spirals, the city is missing something – something that becomes clear when one observes the portraits of the other-worldy architecture: the people. Its public spaces and transit infrastructure were not designed with people in mind. In a nod to a 20th century vision of urban modernism, Niemeyer and Costa layed out the main thoroughfares of the city to resemble, from a bird’s-eye-view, the outline of an airplane or bird. 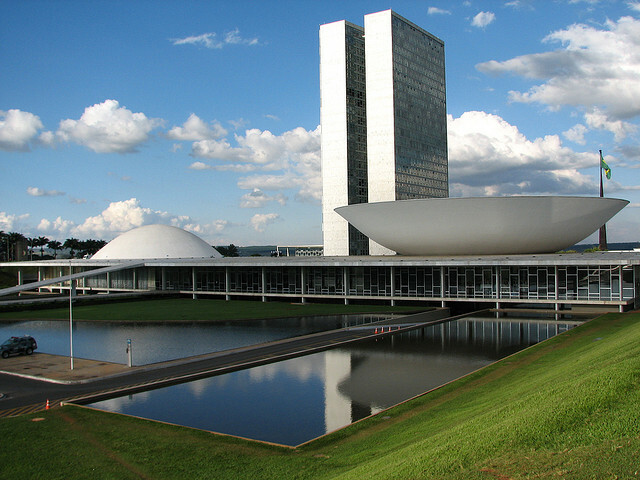 Because of its exceptional design, Brasilia was designed as a World Heritage. This presents a formidable challenge for today’s architects and urban planners, who desire to humanize the city and improve its urban character/urban lifestyle. It is difficult to get anywhere quickly and reliably without a car, and there are no walkable or bikable paths. But now, the call for a wider variety of transit options, safer roads, and better access for a larger number of people, has created the political will to answer people’s needs. Brasilia provides a good example of how a city’s infrastructure, culture, and historical identity can not only enhance, but pose challenges, to designers, commuters, and inhabitants who desire an urban environment conducive to a more ergonomic and transit-oriented way of life. The existing political leadership in Brasilia recognizes this and is taking steps toward solutions. A new Urban Mobility Law will spur the re-design of Brazilian cities, making them safer, healthier, and more accessible to a greater number. In addition to a light -rail system (LRT) in the planning stages, new BRT corridors are set to be installed in 2013 and 2014. In a June 2012 CityFixBrazil post, Nazareno Stanislau Affonso, coordinator of the National Movement for the Right to Quality Public Transport and Brasília’s office of the National Association of Public Transportation (ANTP), recommends addressing existing parking policies, as a means to effectively limit automobile users. Yet Affonso calls for not only a change in public policies, but a change in values, lifestyles, and our vision of the future. In this way, generations can appreciate the value of Brasilia’s history and legacy, both as a World Heritage site and as a place to live, work, and enjoy.